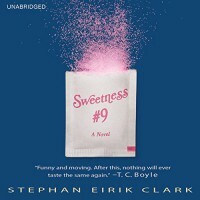 Here’s what I love about SWEETNESS #9: introducing me to Stephan Eirik Clark. His storytelling has a special flavor (sorry about that pun) that is fascinating and stands on its own. As the story progressed over decades of time, I felt the characters change. I wasn’t just a witness, but I could sympathize and feel. As a reader, I was involved with the characters making realistic connections along the way, especially true with protagonist David Leveraux. The scariest story is that which mirrors reality. Clark often had me researching sweeteners and flavorings, including scanning through congressional reports. The best type of writing spawns action. And yes, while some readers may find certain final elements “preachy”, the narrative serves as a springboard for conversation. I think this is great. The writing was so realistic that the final footnote convinced me to Tweet to the author asking for more information. And I do want to know more. This is an interesting fictional work that goes well with non-fictional works like FAST FOOD NATION. The story element of SWEETNESS #9 offers several interesting facets: from personal and business details to the more global historic aspects. There’s liberty taken to enhance (again, sorry for the pun) the actual, real-life details, but it makes the pages flip all the faster. I enjoyed all the author’s included elements, both miniscule and widespread. It all served to make an excellent reading package. Yes, some of the diet structures may skirt the boundaries of comfort, but that’s part of why I read: to question and to learn. Overall, this is a great book and is something that has whetted my appetite (sorry, last pun…maybe) for more. Thanks Little, Brown for providing this electronically for my review.